Thai Airways International Public Company Limited, trading as THAI is the flag carrier airline of Thailand. Formed in 1988, the airline primarily operates out of Suvarnabhumi Airport. THAI is a founding member of the Star Alliance. The original name for Thai Airways was Thai Airways International and it was established as a venture between SAS and Thai Airways Company. The company’s first flight took place on the 1st of May 1960. Then, in 1977, the Thailand government purchased all the SAS stakes. Eleven years later, on the 1st of April 1988, the two parties that made up the venture merged to form Thai Airways International. 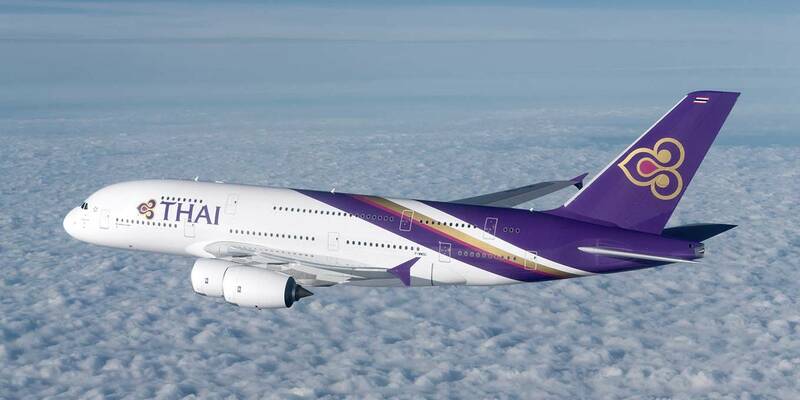 Thai Airways offers top-quality service, on-time and hassle-free operation at the best possible fares! Thai Airways operates a fleet of 80 aircrafts. Thai Airways operates flights to 84 destinations across Asia, Australia and Europe. Thai Airways is a full cost carrier and its aircraft cabin is divided into three cabin classes. In the spacious first class cabin, you are greeted with fine champagne and silken caviar whilst you feel completely at ease on a fully horizontal bed in the tranquility of your semi-private suite. A diverse range of elegant cabins and seats are available on our various routes and aircraft for your mesmerizing journey. The finest of THAI service, with innovative, gourmet, culinary delights along with luxurious amenities, in-flight lounge areas and even changing rooms to allow you to freshen up and slip into something more comfortable. THAI invites you to their elegant business class cabins that are inspired by the rich culture and heritage of Thailand. The hosts are on hand to serve you with refreshing beverages. Recline in comfort in your reclining chair as the crew provides an impeccable service and take advantage of more than a thousand audio and video selections on demand while on your journey. Your reclining chair is your lounge, office and bed in the clouds. Catering for your diverse needs while en-route to your destination with a range of amenities throughout the fleet of aircraft. With the spacious exclusive cabin, impeccable service and award-winning cuisine THAI continue to provide a world-renowned service with innovation to ensure your journey is as smooth as silk. As you embark on your journey, sit back, relax and enjoy the extensive ‘Media Library’ with a vast selection of movies and selected songs on your very own personal in-seat touch screen monitor with wider seats with more than generous legroom that you cannot find amongst other worldwide airlines. Thai Airways’ frequent flyer program goes by the name of Royal Orchid Plus. This is touted to be one of the quickest growing frequent flyer programmes in the world. The number of qualifying miles points earned, determines the status of a passenger’s membership on the Royal Orchid Plus frequent flyer programme. Each status has its own unique benefits and privileges. Qualifying Miles refer to the total number of miles flown, added to the service miles earned on flights operated either by Thai Airways or by members of the Star Alliance. Book tickets for 10 travellers or more with Thailand’s flag carrier Thai Airways by FareHawker flight Group Booking desk. We offer Thai Airways group fare facility for all travel portal, travel agencies, corporate & tour operator. Our ex-airliner team members are expert in handling small or large segment of Group Bookings. Thai Airways Flight Lowest Group Fare - Buy Group flight tickets with FareHawker for booking international airlines group tickets on discounted fare. We are the largest consolidator for Group Air tickets in India and abroad. Post Your Group Booking Query for Thai Airways. How to book Group Tickets in Thai Airways Flight ? Any traveller, corporate, travel agency or individual can directly mail to FareHawker Group Desk team by asking for Thai Airways flight group fare. Our group booking expert will get back to you on the same trail within 4 hours. Air ticket booking available at lowest airfare for Thai Airways flights at affordable prices at FareHawker. Thai Airways flight online booking - Book Thai Airways ticket online at lowest air fare at FareHawker. Get best offer for Thai Airways connecting India and abroad! Book Thai Airways tickets with FareHawker as we offer the best-in-class fare options for all types of airline bookings. Our dedicated ex-airliner team with their in-depth industry knowledge offers you the cheapest possible fares for domestic as well as international travel. We take pride in our relationship with the airline partners and it is this relationship that allows us to offer you great travel solutions. We are here not only to find the best flights at cheap airfares but also to offer you consolidated travel services so you enjoy a seamless travel experience. Visit Thai Airways FAQ for all related queries. Terms and condition of FareHawker and Thai Airways apply.